The Four Horsemen blends the flavors of peppermint and black licorice with tequila and rum. It’s a very strong drink – three ounces of straight alcohol with no mixers in sight. The drink starts out with a fairly strong note of black licorice, so if you don’t like that flavor you may want to give this one a miss. The peppermint kicks in next, but the licorice still lingers. It’s an interesting, unusual combination that you’ll probably either love or hate. Fill a cocktail shaker with ice. Pour in all ingredients and shake well. Pour into a small rocks glass, ice and all. 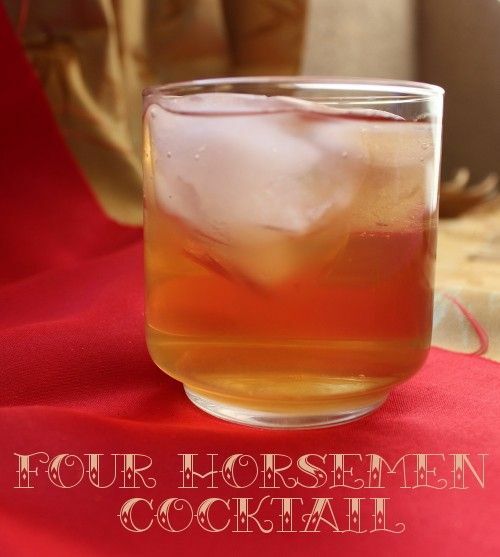 When I bar-tended I was taught that the 4 Horsemen was made up of Jack Daniels, Jose Cuervo, Jim Beam, and Johnny Walker. And that’s how we would serve it. Is this just a rendition of that? Wikipedia lists my version for it, but your variation is on other sites. A lot of recipes have regional variations.